← “Broke wrist” corner claims another victim! Original article here, go have a look and read some of the comments, funny, feel free to leave some comments here though! 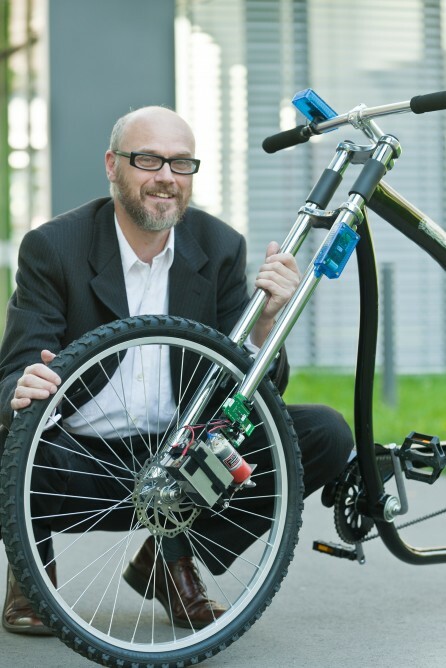 Researchers at Saarland University in Germany developed a system that replaces both the bike’s brake cables and levers with a wireless system that employs control algorithms typically found in aircraft and chemical plants. activated—half the time it takes to blink. activating a pressure sensor. This activates the cigarette-pack-sized sending unit on the handlebars, transmitting the Stop command to an actuator located on the front fork that (obviously) activates the disc brake. A series of redundant sensors located on the fork will provide back up signal to actuator should the primary fork-mounted sensor fail. It’s still in the prototype stage (hence the decidedly boxy appearance) but researchers hope to improve its reaction time and add an anti-lock function in the coming revs. more concerned with the AA powering the sending unit suddenly deciding that it’s out of juice as I crest the top of a large hill. Hopefully, this technology will actually make it to market to give me something to worry about.